Good morning ladies, gentlemen, and theropods. I am officially entering the race for President of the United States. My name is Bill O'Rights, and I believe in America. My belief in America stems mostly from the fact that I've seen it on lots of maps. Plus, a lot of people want to bomb it. Sounds real to me. And so I see no reason why I shouldn't rule it. I am more a part of America than any other candidate, because my ancestors come from the hills of Montana. If you don’t believe me, go visit some of the gift shops. Anyway, there is much I want to do for this country. I feel strongly that speed limits in residential areas should be increased considerably. I’m barely jogging at 15 mph. Also, the walls, fences, and barriers in zoos across the country, are too high and too strong. They don’t make it easy to get into the animal enclosures. Of course I’m only thinking of the mothers and children, who may accidentally drop purses or toys into the animal territories. No other reason. There’s also a topic no politician wants to talk about: Over Population. It’s a real problem, and I have a real solution. The details are, unfortunately, classified, but I assure you, if elected, I and my party will take care of this in record time. I'm intrigued by Mr. Bill O'Rights, although a little scared. Also, his name is close to that of Bill O'Reilly who is not a nice person. Well, I'll put him in my "maybe" list. Thanks, and hope to hear more. Ohhhhh dear, he seems familiar. Maybe he reminds me of some other politicians I have listened to lately. I don't think I will be able to get behind his party line. Phil A. Buster is still getting my vote. Please don't eat me, Mister O'Rights! Why do I suddenly feel like a snack? A little too violent there Bill...why would I want you when you come on so heavy! At least shield your rhetoric in political double-talk so everyone won't panic...get it? Do you need a tasteless campaign manager?? That's a great name. He's a bit foreboding but I have no doubt he could rule the world or just this country. Darn...it's going to be a tough decision. Yeah that's what you want, dino-mite speeds through neighborhoods. BTW...made you blog and new blog of the day. @Belle, That is a negative that his name falls so close. His thoughts on population control are roughly how I figure O'Reilly feels. @Stacy, He does have a hard stance. Have to admire his convictions though. 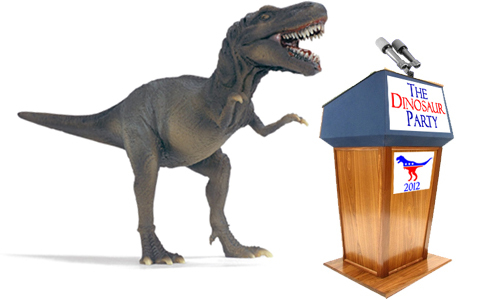 @Budd, Regardless of any personal views, the Dinosaur Party as a whole discourages the eating of humans. @Chuck, We are always looking for those wanting to contribute to the efforts of the campaign! @Marlene, That's a good question to pose to him. @Robyn, When choosing your future leader, should the choice ever be easy? @Copy, Thank you very much sir! I like how he wants to raise speed limits, but Phil still has my vote with free public transit. Hahaha!! I loved this, but I don't believe you Mr. Bill O'Rights! You want to eat those animals in the enclosures. All you politicians do is LIE! Just lie, lie, lie! I am really upset that nothing has been said about the ALBERTA DINOSAURS because they really knew preserve a skeleton so it could be displayed properly millions of years later. @Dave, It is a compelling platform. @Kelley, It's sickness with them. Lying through their very large teeth. 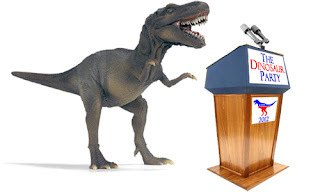 @Kal, Our constitution only permits American dinosaurs to run for president. We need to start setting up dinosaur party in Canada as well. With those who follow the same ideals. Mainly that of being a dinosaur.